Data at the centre of the NHS scandal has been grossly misrepresented in reports that 1,200 people died needlessly or avoidably at Mid-Staffordshire hospitals. Even reports that deaths at Mid-Staffs were “excess” distorted a statistical measure that experts warned was unreliable when they reported it to Mid-Staffs, sparking the scandal in 2007. Experts warned the consequent Public Inquiry that people might not be able to handle raw hospital mortality data, which they said should be taken with a pinch of salt: the complex array of factors that determine someone’s real chance of survival when they are taken suddenly to hospital with a serious condition. It was feared mortality data would spark the sort of simplistic outrage that has indeed characterized public response to the Inquiry. It could create a culture of fear, they warned. Roger Taylor, director of research at Dr Foster Intelligence, the firm that produced the data that became the scandal, told Computer Weekly the statistics had been “woefully poorly misunderstood”. “There is no number for the actual people who might have died avoidably,” he said. “It is impossible to put an actual figure on it”. Yet press reports continue to describe the Mid-Staffs deaths as avoidable, needless or excess. The most abused statistic is the 1,197 people with who died while being treated for the most mortal conditions. Dr Foster derived the number by calculating statistics on people who died from conditions as serious as cancer and as perilous as urinary tract infections. It calculated that 8,688 people should have died at Mid-Staffs, based on a national average of deaths in hospital of people with serious conditions. It expected to see that this many people had died over 10 years at Mid-Staffs, using data gathered by the NHS and fed into its formula, which it calls the Hospital Standardised Mortality Ratio (HSMR). It found instead that 9,885 people had died while being treated for serious conditions at Mid-Staffs over that decade, between between 1995 and 2007. This was 1,197 more deaths than predicted. Deaths as predicted would have amounted to a 5.6 per cent death-rate for the 154,674 people treated for serious conditions at Mid-Staffs over the period. The actual death-rate was 6.4 per cent. The difference between the estimate and the actual death-rate was 0.8 percentage points. There has been outrage that even a single person should have died needlessly at Mid-Staffs hospitals. It has been said that these are not statistics, these are people. The outrage has however been about a statistic. People were removed from the equation the moment the individual tallies of their deaths were collated. They people were not in the equation when Dr Foster calculated the statistics that caused the scandal. The outrage has attempted to transmute the statistic back into people again. It cannot be done. People have also been outraged at any attempt to alleviate their outrage over the death statistics with an appeal to statistics. People say even one avoidable death is one too many. Yet the Mid-Staffs Inquiry was adamant that it could not tell how many of these deaths were avoidable. It could not tell how many significant mistakes were being made at the hospital, if many at all. Most crucially, it could not support claims that neglect and clinical error had caused 119.7 patients to die every year at Mid-Staffs since 1995. 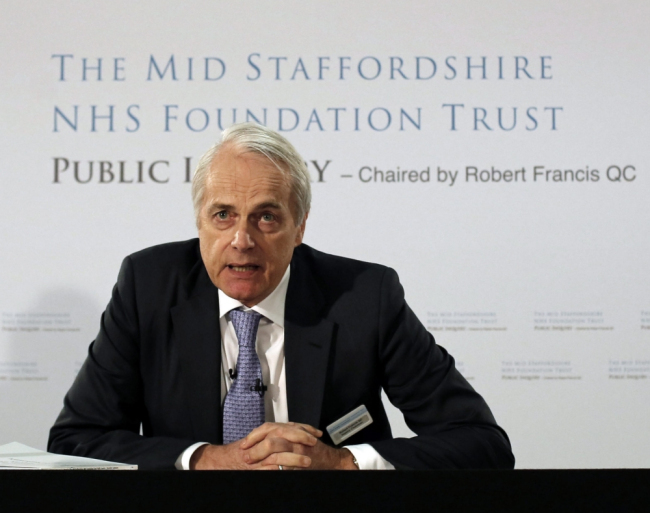 As Robert Francis QC, the clinical negligence lawyer who conducted the Mid-Staffs Inquiry, said in his final report last month: “Unjustifiable conclusions continue to be drawn from the numbers of deaths at hospitals and about the number of avoidable deaths”. “HSMR cannot and does not claim to establish whether any particular death or group of deaths was avoidable. The Inquiry was not even asked to determine whether medical negligence or simple, tragic error accounted for any deaths at Mid-Staffs. It would have required complex reviews of circumstances around each and every death at hospital and could not have expected to be conclusive. Independent reviewers did examine case notes for around 200 of people who died at Mid-Staffs hospitals between 2005 and 2009, and whose relatives had sought a review. These were drawn from around 2,700 people who had died of a serious condition at the hospital in that time, which was 5.7 per cent of the 47,000 people who were treated for one. Only 2,200 deaths were expected, or 4.7 per cent based on the national average. It found 120 incidents of “unacceptably poor” care. It did not report incidents of avoidable death. Few avoidable deaths are actually known to have occurred at Mid-Staffs, where it is as easy to tell a tale of heroic endeavour as one of horror from the treatment of more than 50,000 people who are treated there every year. That is how we are used to seeing the medical profession: in Casualty on television, in Florence Nightingale, in the opening ceremony of the 2012 Olympic games. Francis’ first report from the Inquiry repeated numerous tragic anecdotes of neglect and error, many of which ended when the patient died. There were delays in treatment, misdiagnosis, understaffed wards, people left without water, or with so little attention that they had no choice but to use their beds as toilets. These incidents created a terrifying picture that led to those unjustifiable conclusions about avoidable deaths that Robert Francis was at pains to avoid. 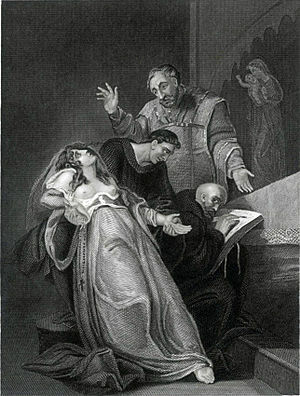 Francis and others who have looked closely at Mid-Staffs – including those physicians who conducted the case note reviews and those who advised the Inquiry – have nevertheless been unable to determine how many deaths may have been avoidable at Mid-Staffs, let alone how many were caused by criminal neglect. Even Professor Brian Jarman, whose research at Imperial College founded Dr Foster, told Computer Weekly he had not tackled the question. 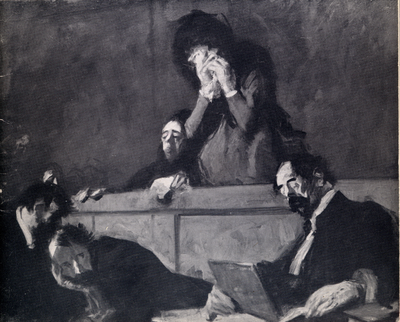 The human body, medical conditions, hospital environments, the social context within which someone has lived a life, the links between psychology and physiology: these are each so complex on their own as to make the cause of death of someone suffering a serious medical condition hard to pin on someone as blame. That is not to say there are never cases of criminal negligence either brought or let go. Some have looked at the Mid-Staffs studies and claimed only one avoidable death occurred at the Trust between 2005 and 2009. Others, like prime minister David Cameron, have preferred to suggest a link between soiled sheets and death through neglect. 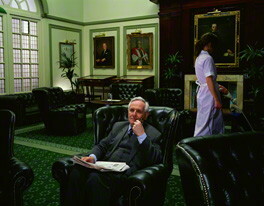 His condemnation of Mid-Staffs hospitals in parliament on 6 February – the day Francis published his final, 1,794-page report of the Inquiry – would have assuaged distress relatives. But there are signs that this has served those on the political right who would exploit the moral panic that has flourished under Cameron’s watch to damage the NHS. Reality might exist somewhere in between Casualty and the Tory right, in a non-barbarian interest in using mortality data to improve healthcare. 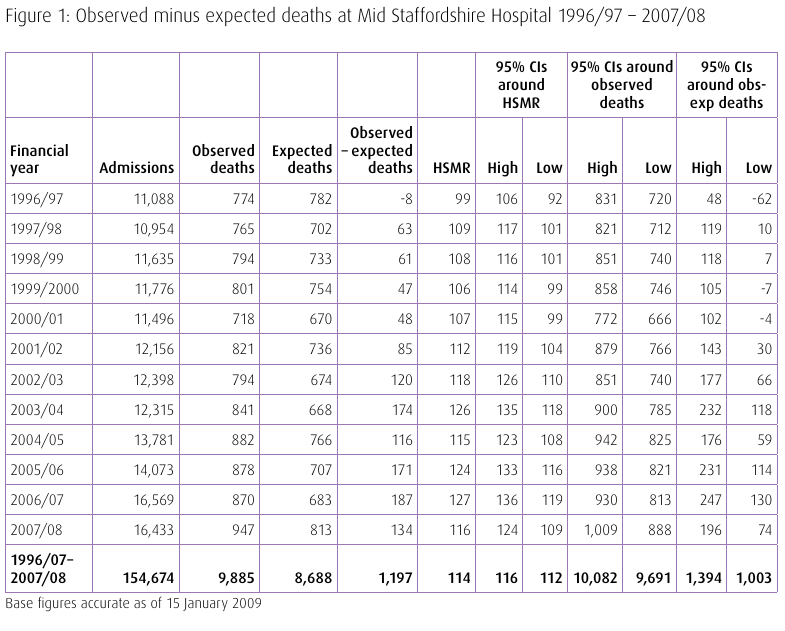 Even the statistics cannot determine how many avoidable deaths occurred at Mid-Staffs. Imagine a hospital with 100 patients, Taylor told Computer Weekly. Imagine the statistics have estimated that it should have a death rate of 20 people, or 20 per cent. Then its actual death rate turns out to double, at 40 per cent. You might say those deaths are “excess deaths” statistically, in that the 40 actual deaths exceeded the statistical estimate of 20 deaths. But the terminology creates that woefully poorly understood impression that 20 people died avoidably. Imagine the hospital of 100 patients had 20 who were 100 per cent guaranteed to die before they leave, and 80 with not even a single chance of death. If all 20 of those who were fated to die did actually die, then the hospital would have met its statistical quota of dead patients. If 20 people out of the 80 without a single chance of dying did actually die as well, then it would be true to say there were excess deaths. But the only way you could say those deaths were excess would be if this preposterous example were possible. Now imagine a hospital with 100 people, each of whom have a 20 per cent chance of dying. If 40 patients die, that would be 20 more than expected. But which of those 40 people died avoidably, said Taylor. The stats give good reason to inspect a hospital to see if there are any problems that might account for more seriously ill people dying than average. This is what the Francis Inquiry was getting at. This is also what Mid-Staffs did immediately the Daily Telegraph brought Mid-Staff’s above average death-rate to it and the country’s attention in 2007. Even so, Taylor told the Inquiry, hospitals should not even be expected to investigate all the mortality alerts generated by the computers it has watching over NHS data, “as many would turn out to be caused by matters of no real concern”.